Let me begin by saying I'm okay in python in general (and a half-decent programmer in some other languages), but I am very very new to python in Blender. I have multiple objects all right on top of each other - say, a cube (1), a sphere (2), and a cone (3). When the game begins, only the cube is visible. The player can cycle through the objects by using the M and N keys, as in, when you cycle forward the cube becomes invisible and the sphere becomes visible. The player hits M to cycle forward, N to cycle backwards. When you hit the cone (the third object) you can't go forward anymore. Similarly, when you hit the cube (1st object) you can't go backwards anymore. If you're curious, the application is I'm making a scientific visualization tool where you can step forward and backward through time while looking at datasets. I believe (but may be wrong) that I want to have some integer variable V that begins at 1; when you hit M it counts up; when you hit N it counts down; a statement checks if it goes below 1 or above 3 and corrects it back to 1 or 3 if so. This script, connected to a keyboard sensor called space_key with spacebar in tap mode, will toggle the visibility of the object in which the keyboard sensor resides. That doesn't help me handle multiple objects though. How do I change the visibility of multiple objects (perhaps using the object name) from one script? Where should this script reside, along with the M and N controllers? Should it be attached to the cube, or to some empty object somewhere? Or is it going to have to be multiple scripts? If it has to be multiple scripts, how does the variable V get initialized properly, and how does it get globally recognized by all the different scripts? You have a set of (ordered) objects = a list. You want be able to select the next while deselecting all others. Open Question: What should happen when the last object is already selected? As there is always one object selected I suggest to use a token that indicates what object is selected. This means you need a separate object as token. When you want to know what object is selected ... ask the token. If you want to select another object ... request it at the token. Where should this script reside, along with the M and N controllers? Should it be attached to the cube, or to some empty object somewhere? Or is it going to have to be multiple scripts? -> the token does that. So lets have a closer look at the token. It needs to know what object is selected. We need a storage for a single game object at any time. Lets look at a possible implementation of the token. This is indeed not much. First (as any BGE code) check the sensors' status. Then deselect all selectable tokens. If you load them unselected, you can just deselect the current selected object deselect( getSelected() ). Then find the next object and select it. I hope you find this is what you want. ---> Python controller Module: "selection.next"
This will deselect all selectable objects and select the first one after loading the scene. Please note, next() does not do anything when not all sensors are positive. Therefore you can't connect both sensors to the same controller. You tried that? I hope you noticed the code is not complete. If you want you can try to implement your own version. But here are the details that can help you. Here you see that selection/deselection actively changes the involved objects (setting visibility). When selecting the object running this code will store the selected object in a property replacing any previous selection. Finding the next selectable object is simply looking at the list and grab the next one by index. If the current selection can't be found, it the first one gets picked. If the last one is selected ... it starts with the first one again nextIndex % len(selectables). If you do not want that you change that code to min(nextIndex, len(selectables)-1). As said earlier you should implement your own version on getSelectables(). The utility functions are often used and would live happily in a common module. They are here to complete this snippet for you. As homework you might want to implement a previous() function. Variables are always local to the code. You could create a module variable that is a singleton with the module. The above solution uses a property of the selecting object. This means you can have different selecting objects each with own selection (I guess this is not what you want). If you want to know if an object is selected or not you have to ask the selecting object. Alternative, you can check if the selectable object is visible or not. I know you didn't ask for it, but i'm going to throw the logic brick answer out there just in case anyone who hates python with a passion comes along later with the same question. 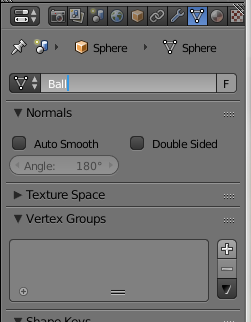 you will need to make sure you named the meshes of the three different objects, not just the object name. This can be done under the "Mesh" panel of the properties editor. next, you need to add a new mesh object on another layer. It really doesn't matter what shape it is because you will never have to see it. I used Suzanne since she isn't already being used in this example. We will be changing the variable to tell the suzanne object what mesh she should change to. This system is easy to change and because it uses a variable rather than direct wiring, it can slow your system up to 80% less. Don't do that. You don't even want multiple objects executing the same script. What you want is to set up a dummy object to control things for you, you give that your keyboard sensor and a python controller and nothing else. Just sets your scroll status to 1 every single frame, even if you hit a button the frame before. What you need is to check the space that's persistent and because of decisions made in the past the only place you can find that is in objects. This creates a property while the game is running and you now have a persistent variable you can check. I should add that your idea about hitting a key and increasing your counter is absolutely correct and the way I would do it too, so I didn't include that here. This should solve your particular problem, the stuff I didn't cover is not really related. if "key" in ob.name: #like "key" in an object named "object1key"
How to apply proportional force based on length of keypress?